Ball bearings reduce friction between rotating shafts and the housings that hold them. 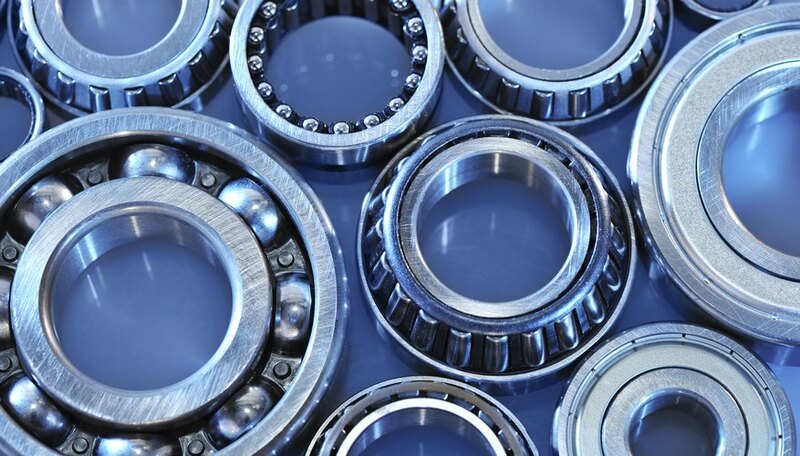 They are called "rolling-element bearings" and their applications range from medical equipment to motors to turbines. The basic design has an inner race to carry the shaft, a ring of balls held in place by a cage to keep them correctly spaced, and an outer race that mounts to the housing or whatever fixture attaches the shaft to the rest of the mechanism. Roller bearings apply the same principle,, but instead of balls, they use cylinders to carry greater loads, sometimes in races angled to carry an axial thrust load on the shaft. Bicycles provide a good example of a ball bearing application where neither speeds nor loads are high. They carry wheels on the axle spindles, the crank in the frame, and the pedals on the crank. Older versions don't have a cage to position the balls; they ride in a cup, held in place by a cone. The space between the balls is packed with bearing grease, and the clearance between cup and cone is adjustable so the bearing is not loose enough to allow play nor tight enough to bind the bearing. Newer versions are made as sealed cartridges. High speeds put stress on bearings in several ways, including heat from friction, lubricant shear and centrifugal force. Rotational speed is not the only factor to consider; bearing designs also consider the diameter of the bore. Bearing speed is defined as a value of dN where (d) is bore diameter in millimeters multiplied by (N) which represents the rotational speed. Applications include turbochargers in automotive and aerospace designs, medical and dental equipment and high-speed machine tooling equipment. "Hybrid" designs use ceramic balls instead of steel for the advantages of reduced weight, greater smoothness and longer bearing life. Axial or thrust loads push and pull on the rotating shaft. Moment loads attempt to twist the bearing. Consider a swivel caster, with a wheel bearing and a swivel bearing. The wheel bearing supports weight as a radial load, on the axis of the bearing, and the swivel bearing supports the weight as a thrust load, perpendicular to the bearing. Because the wheel bearing is offset from the axis of the swivel bearing, a moment of torque applies to the swivel bearing. Vehicle wheels provide another example of axial loads from cornering forces. Linear roller bearings work like ball or roller bearings, except they're arrayed to carry loads in a straight line. Applications include guidance systems for moving industrial equipment and monorail trains. "Transfer tables" are studded with ball or roller bearings so objects can roll over and/or across them. Those bearings turn on ball or roller bearings of their own. They are used in assembly lines and package or baggage handling, along with some grocery checkouts. Silbajoris, Alex. "What Are Ball Bearings Used For?" Sciencing, https://sciencing.com/ball-bearings-used-for-5733387.html. 24 April 2017.